12.00: Embark at Hon Gai International harbor. 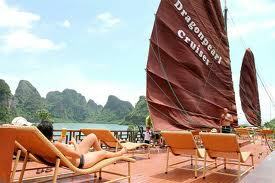 13.30: Have lunch while cruising to magnificent Bai Tu Long Bay, admiring by the fascinating formations of the Bay. 15.00: Cruise to Cap La. 07.30: Morning view of Bay’s landscape with a cup of tea or coffee. Have breakfast in the fresh air. 08.30: Visit Thien Canh Son cave. Then, enjoy swimming. 10.00: Start cruising towards the harbor while a Buffet lunch is served. 16.00: Arrive in Hanoi. Trip ends. Children under 6 years sharing fully paid cabin with 02 adults: No additional charge, limited 1 child per cabin. The itinerary may be subject to change due to the bad weather condition.